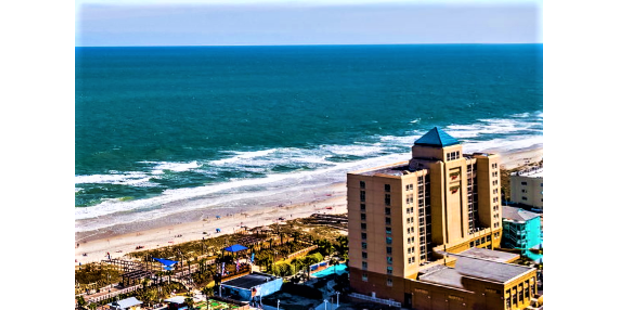 Located directly on the oceanfront of beautiful Carolina Beach, you are only steps away from having your toes in the sand. Retreat to your oceanfront guest room, and kick back on your private balcony to enjoy all the views of Carolina Beach including the award winning Boardwalk. Whether you’re unwinding by the outdoor resort style pool, or enjoying the indoor pool and Jacuzzi, you’ll find relaxation at your fingertips. Recharge with cocktails or delectable dining from the Bistro (offering breakfast, seasonal lunch, and dinner) and on-site Starbucks. Centrally located just two blocks from the Marina with other nearby local destinations of the Aquarium at Fort Fisher, Carolina Beach State Park, Southport Ferry terminal, award winning restaurants and a brewery with disk golf.